A virus spreads across Deep Space Nine that causes neural aphasia. Miles O'Brien seems more at home on Deep Space Nine than he ever did on the Enterprise. On TNG, O'Brien was almost redundant; the ship had an engineer in La Forge, and thus O'Brien could never rise above being a secondary character. Here, his improvisational engineering skills are more useful and needed, and as the Chief Engineer of the station, he is a far more important man, not to mention his history with the Cardassians. He also seems happier, though a bit more exhausted and stressed out. I'd go so far as to say that O'Brien is much more interesting than La Forge ever was, though I wouldn't dream of comparing him to the great Montgomery Scott. I've spent time with a couple of people who suffered from mild aphasia (though it wasn't the intense global aphasia seen in this episode), and the actors--particularly Colm Meaney--do a really good job imitating it. In "Emissary," Quark claims that, in four years, Odo has never caught him stealing. In this episode, Odo finally does it. 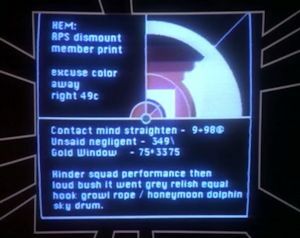 I like that the words on the display screen get jumbled as the aphasia starts to affect Dr. Bashir. This episode might have more punch if it offered more from the perspective of the afflicted, showing just how lost, alone, and terrified a person can become with severe global aphasia. This episode is good for showing O'Brien in his element and developing an interesting dynamic between Quark and Odo. However, the central plot idea never goes anywhere interesting; it could be any old virus, because the story never makes use of the unique problems of aphasia. Once somebody gets afflicted, they essentially just exit stage left. It's not a total waste, but it falls into an all-too-familiar pattern from TOS and TNG (this is kind of like the DS9 version of "The Naked Time" and "The Naked Now," only without the fun drunkenness). It's amazing how quickly Quark and Odo fall into their unique rapport. The characters have barely been introduced, but the relationship between them is already very strong, complex, and entertaining. I don't believe the writers knew at this point what they were eventually going to do with Bashir in "Doctor Bashir, I Presume," but it is interesting how fascinated he is by genetic engineering and how eager he is to meet the "genius" who created the aphasiac virus.